Elk Petroleum Limited (ASX:ELK) has sold Ash Creek oil field to Sunshine Valley Petroleum Corporation and PRE Resources, LLC for $1.7 million. Elk’s US subsidiary, Elk Petroleum Inc., entered into a Purchase and Sale agreement for the transaction, and is expected to complete the transaction on 22 September pending the completion of the due diligence process. While the $1.7 million will provide immediate funding to the company’s working capital, the transaction comes with a $1.9 million impairment. Impairment expense is recorded when an asset’s recorded accounting value exceeds the selling price at disposal. The difference between the two values is the impairment expense. 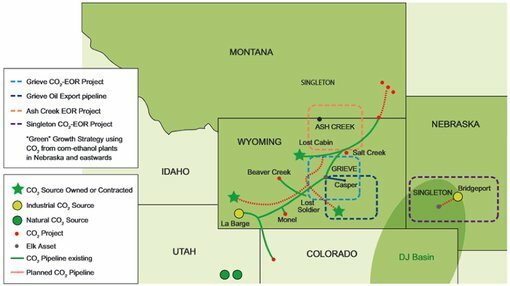 The Ash Creek sale is part of a move first announced by Elk in June 2014 to place its Wyoming assets up for sale through broker Meagher Energy Advisors. These assets include Grieve CO2 – EOR (35% interest), Grieve oil pipeline (100% interest), Grieve Niobrara development rights (100% interest) and Ash Creek (100% interest). A number of factors contributed to the plan to divest Elk’s Wyoming assets. An underperforming share price, operating cost expansion, and a revision of operational objectives were all factors. Potential buyers for Elk’s remaining Wyoming assets have been shortlisted to two companies. While adequate working capital remains a top priority for Elk over the short-term, Elk would prefer to retain an interest in the Grieve project. The exact nature and structure of the deal for the remaining assets is currently under discussion.